Last week, Part I of my Los Angeles Report covered an outing to CB1 in the historic downtown neighborhood. Part II takes me south to San Pedro, a small neighborhood bordering the bustling Port of Los Angeles, east to an industrial area beyond the Los Angeles River, and then west to leafy, lush Santa Monica. 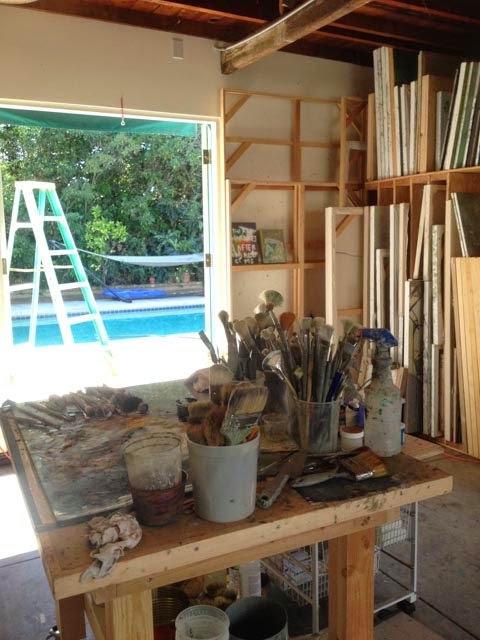 In San Pedro, I visited Marie Thibeault’s studio (pictured above), which is housed in a small building constructed behind her craftsman-style bungalow. Thibeault’s new series of large-scale canvases reference the surveillance state and other unsettling news stories. 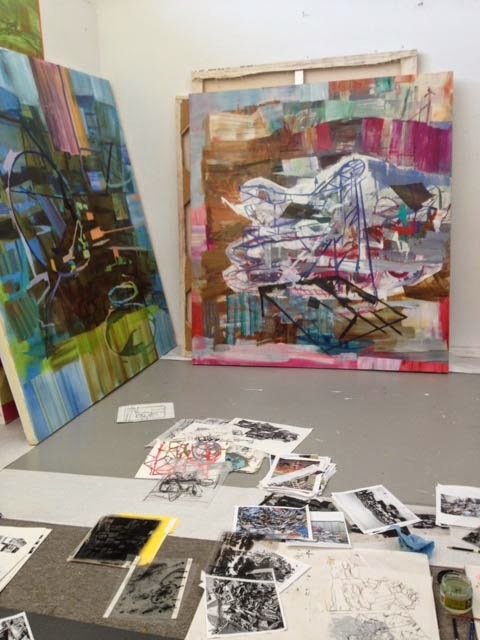 With a solo show looming, she was working on several things at once, and the floor was covered with Xeroxes and drawings collaged together, which formed the basis for new paintings. 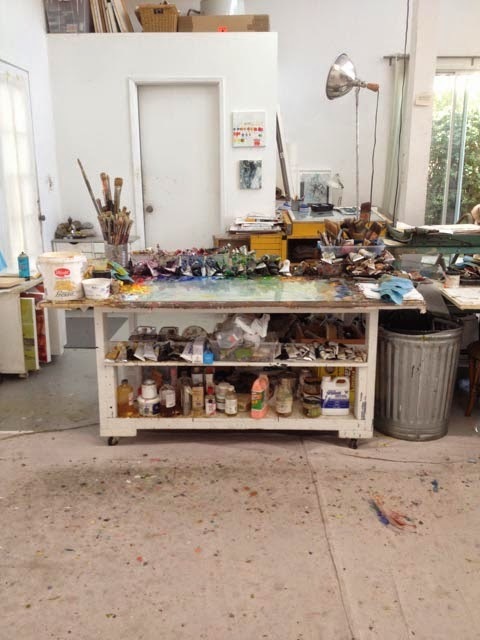 Thibeault’s paintings feature highly saturated color (her painting table is pictured above), and we had a long conversation about the meaning of color. She highly recommended David Batchelor’s book, Chromophobia, in which he argues that color, deemed superficial and unworthy of intellectual consideration, has been marginalized in Western culture. This little setup was a construction site on the quad at California State University Long Beach (I was on campus for the Art and Social Media Symposium organized by Thibeault), but doesn’t it look like some sort of public art installation? 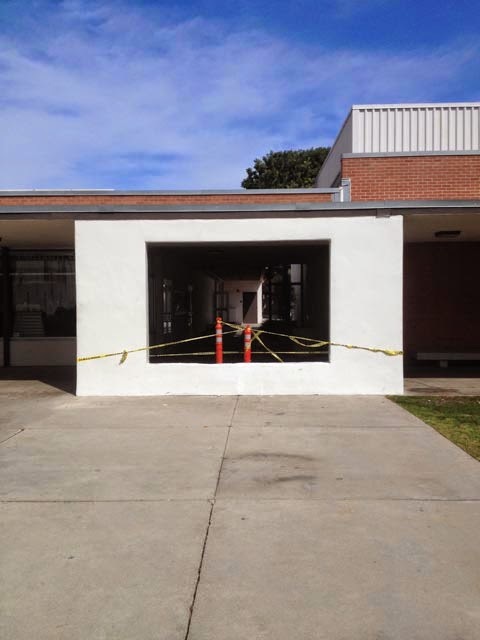 UPDATE: This image is of Robert Irwin’s “Window Wall for Cal State Long Beach.” Originally built as a temporary installation for “A View Through,” a 1975 exhibition organized by a Museum Studies class, Irwin gave permission to reconstruct it in permanent materials in 1976. I’m not sure what the orange cones and police tape signify, though. Thanks, Marie, for posting a video about the piece in the Comments section. In one of the campus galleries, after my lecture, the California State University Long Beach Painting and Drawing Program undergrads had organized a reception where a sampling of their work was on display. Clearly Thibeault’s color theory class has had a big impact on her students. 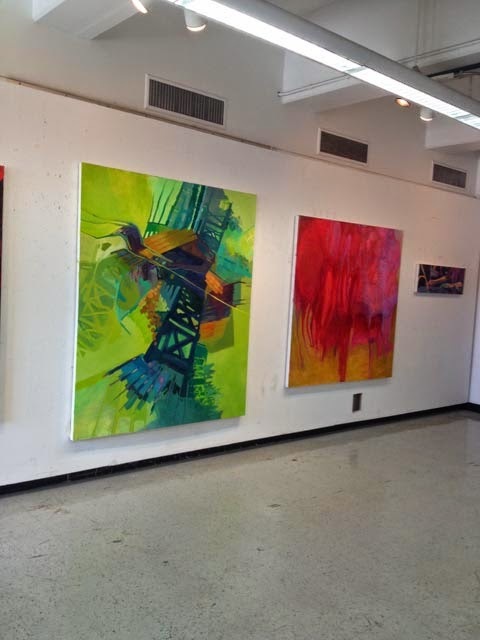 UPDATE: A reader wrote to say that Marlee Donati painted the green canvas and Courtney Heiser made the pink one. 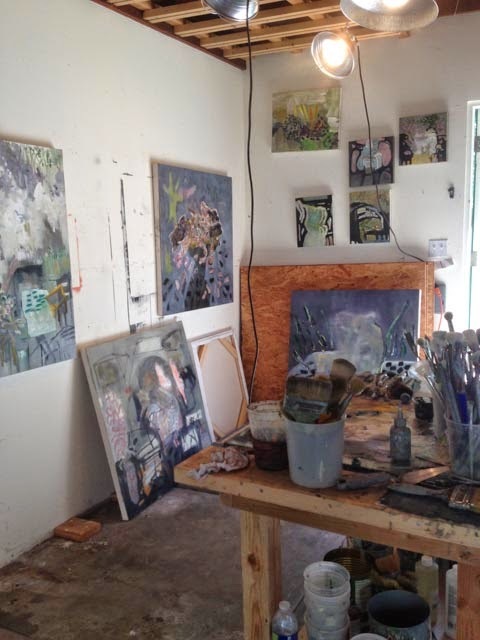 The next day, I headed east via Sunset Boulevard to Lincoln Heights (I think), where painter Laura Owens has turned a two-building industrial complex into a studio and cavernous gallery space. 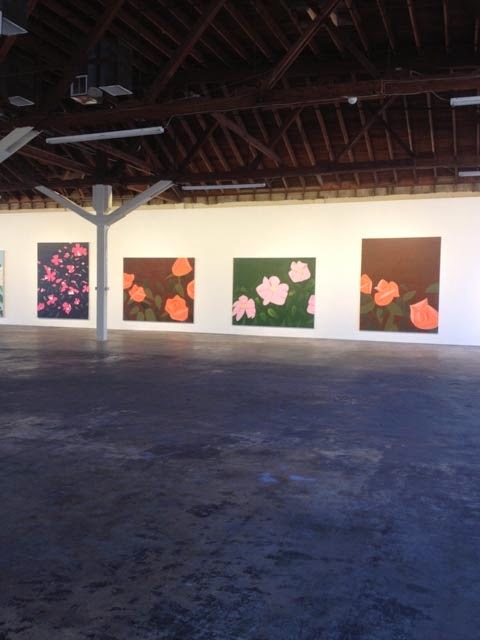 During my visit, nine of Alex Katz’s flower paintings lined the walls of 356 S. Mission Road. Lightly painted with masterful brushwork and luminous color, the enormous canvases appear to have been painted wet-on-wet, in one go. The subject matter may not be as compelling as Katz’s earlier figurative work, but these paintings, on view through July 7, aren’t about garden design or abstract composition. They’re about the process of painting on a grand scale. I was bowled over by his astounding technique. 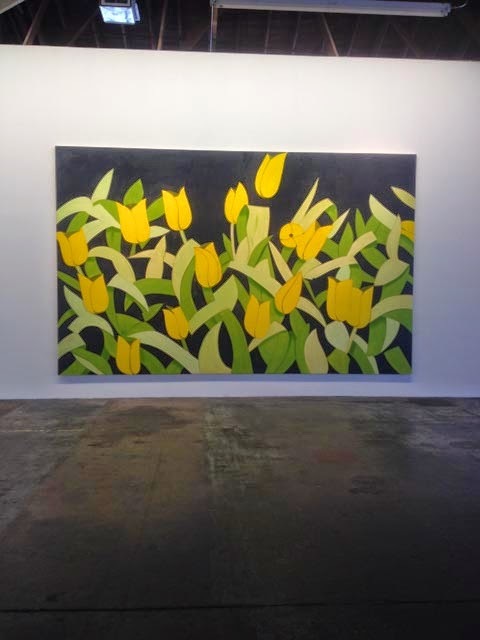 According to the gallerist on duty, the painting pictured above will be Katz’s last flower painting. An important NYC museum is rumored to be buying it. Later in the day, I rode out to Santa Monica for a visit with artist / blogger / psychoanalyst Julia Schwartz. Schwartz came to Bushwick for the past two years to participate in Julie Torres’s Bushwick Open Studios projects and she also sat on the CSU Long Beach social media panel the day before. After a long conversation about imagery, we agreed that the best paintings reveal an artist’s subconscious concerns rather than illustrating it. So, please, no overt depictions of anima and animus. 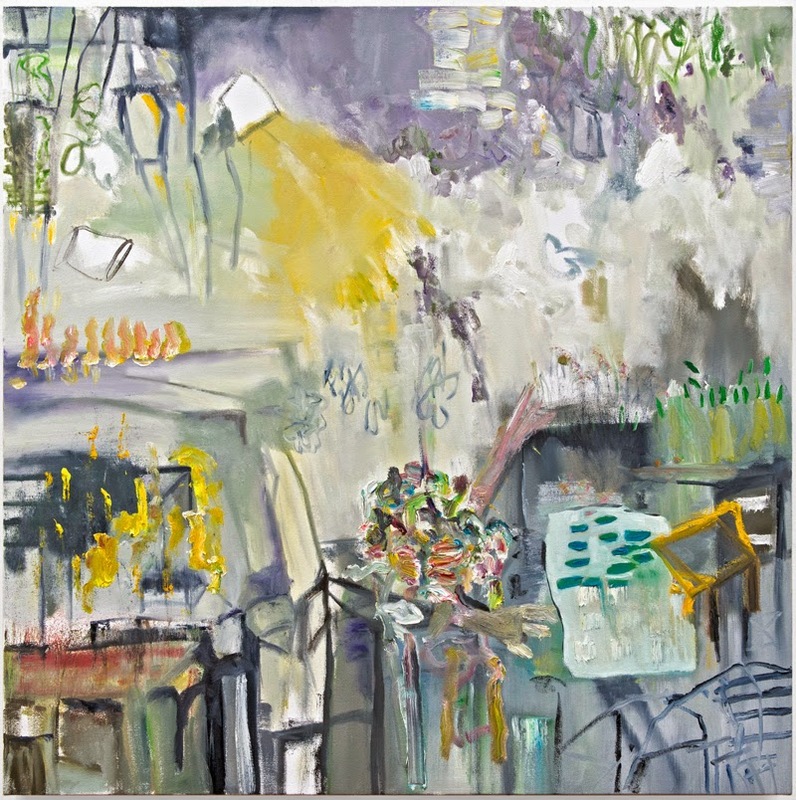 Julia Schwartz, radiant dust, 2014, oil on canvas, 40 x 40 inches. 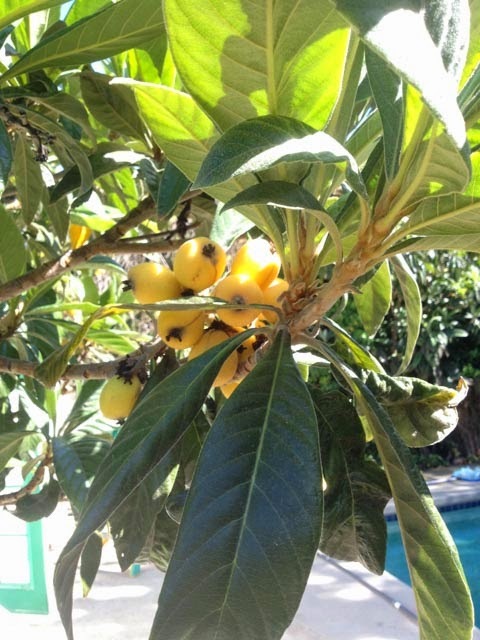 patio and pool, and a lovely loquat tree was heavy with ripe fruit in the garden. Originally from China’s southeastern rainforests and grown in Japan for more than a thousand years, the loquat tree is a bushy ornamental popular in southern Californian gardens. I had never heard of loquats, also known as Japanese plums, and I learned that they have a tough edible skin and small avacado-like pit in the center. In short, if offered a loquat, take it. Both tangy and sweet at once, the lovely yellow loquat is delicious. Stay tuned for Part III of the Los Angeles Report, in which I visit LACMA’s Calder exhibition and Heizer’s Levitated Mass. Sharon, I have been enjoying your blog for years. I love this post because I went to CSU Long Beach, studied with Marie Thibeault and just last week I was at the Katz show and saw your name in the guest book. Hello from LA! Thanks for the note Trina. Sorry i missed you at 356. What a space! That's awesome. I actually recognize some of the art that is featured. The undergrad work (green) is by Marlee Donati and the pink one is by Courtney Heiser of CSULB.